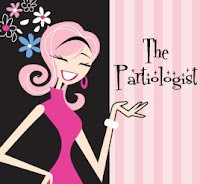 The Partiologist: Chocolate Covered Caramel in a Party Mold! 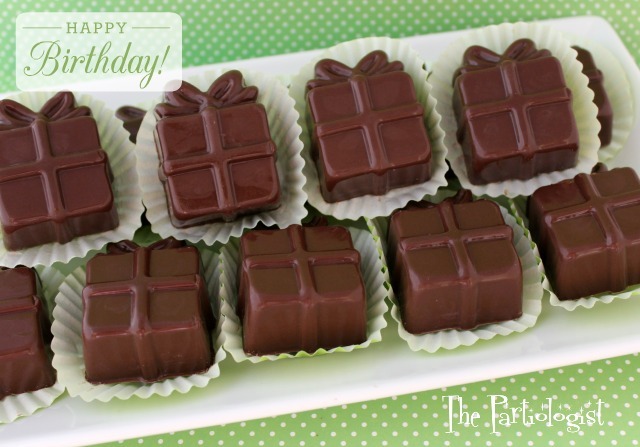 Chocolate Covered Caramel in a Party Mold! Now, I'm pretty sure you want one, I know I do. What a way to celebrate a birthday! Here's that special party mold I used to make the gifts. After making (or buying) caramel, cut into squares. Make sure they will fit the mold. Then cut the remaining caramel. Fill each cavity with chocolate, brushed it up the sides. Add one caramel square to each and cover it with more chocolate. I used Ghirardelli chocolate bars, melted in the microware on half power. Place chocolate mold in the freezer until the chocolate is set. Just like a little tea pot, turn it over and pop them out. Try not to eat them. This is one present you'll need to open quickly. Yum, chocolate caramel is one of my favorite flavor combinations. Me too! Me too, I'd love the recipe! 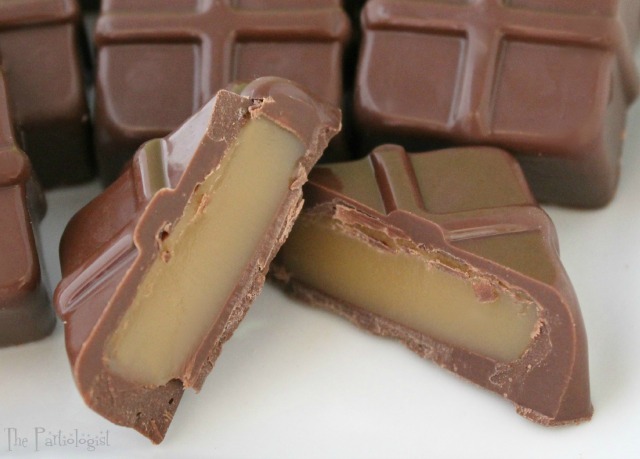 My family loves my caramels..but it's one of my favorite recipes to search out for variations. 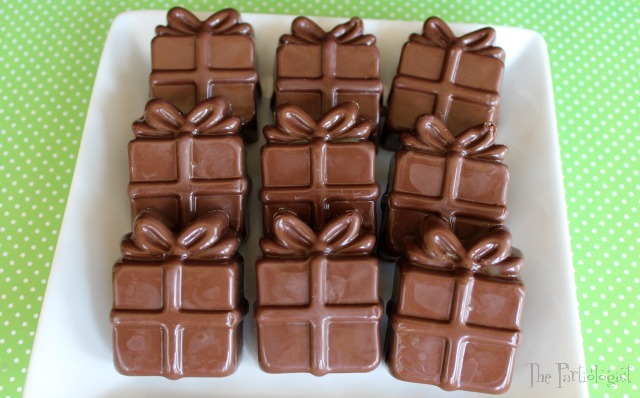 Yours look amazing and how smart to wrap them up in yummy chocolate. I absolutely love everything you post!!! You are so sweet, thank you Paula for the comment! Me three! Me three! I'd love the recipe. You are amazingly talented !! PS Love the brownies from today. Just ordered the bow mold. Now gotta find the present molds. Amazon is out of stock of Martha Stewart present molds. PSS Sorry to be such a tech-dummy, but what is URL? I keep putting anonymous because I don't know how to do the Name URL thing. Of course, I'll send it right over! Oh course! 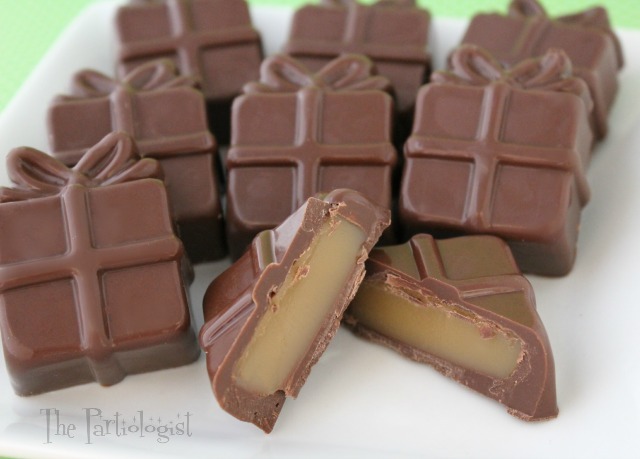 I'll be happy to send you the recipe, no more unwrapping caramels!